The Britax B-Free is a three-wheeled full-size stroller with foam-filled rubber tires. This stroller is easier to push and turn that the Britax B-Agile thanks to the single front wheel and the shorter footprint makes it excellent at negotiating small spaces. This stroller is easy to fold, compact for easier transport, and sports a large canopy with adequate storage. This Britax has a list price over $100 more than its lighter and smaller brother, the B-Agile, but it is nicer quality and self-stands. If you don't mind the limited storage and you feel being easier to push is worth the added expense, then the B-Free may be the Britax for you. The Britax B-Free is a compact full-size stroller with good performance where it counts. In 1996, Britax came to America after much success in Europe. They have been making products for children for the last 70 years, and they are an international best-selling car seat brand. Britax believes that families should live without limits making the most of every day. 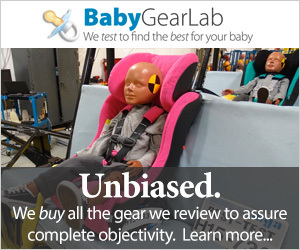 Their goal is to create useful gear with safety in mind with an emphasis on side-impact protection, car seat installation, and strollers. The company works closely with manufacturers, government, and safety experts to create safe products for children. The Britax B-Free (in blue) is an interesting offering from Britax with a performance that rivaled its popular award-winning brother the Britax B-Agile. Performance details on how the B-Free compared to the competition are included below. The B-Free handlebar is adjustable by pressing in on the side buttons at the pivot point. The B-Free earns an average score for ease of use with a 6 of 10 with only a handful of options earning a higher score. The B-free shares the same folding method as the Britax B-Agile with a pull handle on the seat bottom. This handle quickly folds the stroller in half with only a single hand. This stroller has a push button frame release, automatic locking feature and it self-stands, a departure from the B-Agile. Despite being on the small side, the B-Free brakes are easy to reach and about average for ease of setting and releasing. The single action brakes operate with a small press pedal near the right wheel. While not as handy as a bar pedal, they are very easy to set and release even with open-toed shoes. The B-Free has a medium sized storage bin with a 10 lb capacity (above left). Our large diaper bag fits inside, but not much else. You can access the bin from the front and back, but access is limited. The canopy has two small pockets and a medium zippered pocket (above right) that can hold up to a pound collectively. The pockets are useful for smaller items like cell phones, keys, or wallet. This stroller also offers passenger stow pockets on either side of the seat. The pockets are shallow and hard to open wide enough for water bottles and sippy cups. The B-Free canopy has an extra large peek-a-boo window with a magnetic closure cover. The shade on the B-Free is reminiscent of the Britax B-Agile with ample coverage and a mesh peek-a-boo window. This canopy has zip open panels in the center for additional coverage and ventilation for air flow when the weather gets hot. The buckle on the B-Free requires each strap to be inserted separately making it a longer process than it needs to be. The 5-point harness on this Britax is easy to adjust for fit but harder to put on and take off. The B-Free sports the same buckle as the B-Agile with a two-piece buckle that is harder to connect. Sliding the buckle for harness adjustment could be problematic with the shoulder padding, and the rethread style of height changes is basic but doable. The push and pull plastic toggle doesn't work as smoothly as we would like but the seat back has infinite angle possibilities for comfort. The B-Free seat back has a deep recline operated by a plastic toggle for comfortable napping. The toggle works with one hand to lower and two to raise providing infinite angle possibilities, but it isn't as smooth as some of the competition. The leg rest is padded but not adjustable and slopes down to a narrow footrest. The B-Free is only compatible with Britax brand infant car seats, but the adapter comes with the stroller so there is nothing left to purchase. The B-Free is compatible with any Britax infant car seat and comes with side click on adapters. The adapters are easy to use, and the seat slides easily into place once the two sides are aligned. A reassuring click tells you installation is correct and while we didn't have any problems, parents should still give the handle a tug to ensure connection. The B-Free earns an 8 of 10 for set up with a time of 6:45 minutes and no tools required. The manual is good compared to the competition but the illustrations are not as useful as they could be. If this is your first stroller assembly, it could be difficult to figure them out. With a single front wheel, the B-Free is an improvement over the dual wheeled Britax B-Agile earning a slightly better score for maneuverability with a 7 of 10. Only six strollers earned higher scores, of which, four are jogging strollers. The B-Free has a swivel front wheel (above left) you can lock in place (above right) for more control over uneven terrain. The shorter footprint helps this stroller navigate smaller spaces and crowded areas with ease. The foam-filled rubber tires are nice but could be larger for improved pushing ease. The B-Free fold is only bested by that of the Britax B-Agile with a difference of less than 20 cubic inches. This makes it the second smallest option in the group. The B-Free managed an 8 of 10 for weight and folded size with a weight of 22.4 lb and folded volume of 6,674 cubic inches. The folded size is one of the smaller options in the group making it a potential contender if your space is limited and you value maneuverability. The weight is significantly higher than the B-Agile by over 5 lbs but still lower than the average for the group. The B-Free earned a 7 of 10 for quality with slightly better materials than the B-Agile. The B-Free is a little nicer than the B-Agile earning 7 of 10 to the B-Agile's 6, but its price also reflects this. This stroller has a sturdy frame, nice canvas material, and thick elastic on the fold joints. The connections are solid and there is little flex in the frame when pushing weight. The seat of the B-Free has thicker padding that extends down the leg rest. There is a seam at the knee bend that could be irritating on bare legs, but overall passengers should be comfortable.